Mister Bean Barbiere - Divertente gioco di Mister Bean che lavora in un parrucchiere e vuole tagliare i capelli ai clienti e fare tagli di capelli alla moda, ma il suo capo non vuole che Mr Bean sia il parrucchiere. Aiuto a Mr Bean a tagliare i capelli dei clienti senza che nessuna persona lo veda. Buon Divertimento !!! 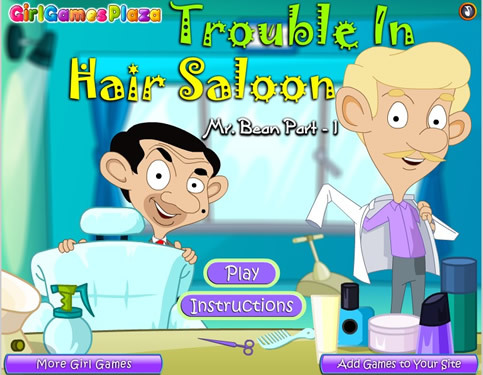 Trouble in air saloon - Funny Mr. Bean game that works in a hair salon and he wants to cut their hair and make customers fashionable hairstyles, but his boss does not want Mr. Bean is a hairdresser. Help Mr. Bean to cut the hair of customers without any person sees it. Have Fun !! !